Get ready to dispense some dueling justice this holiday season when the Yu-Gi-Oh! 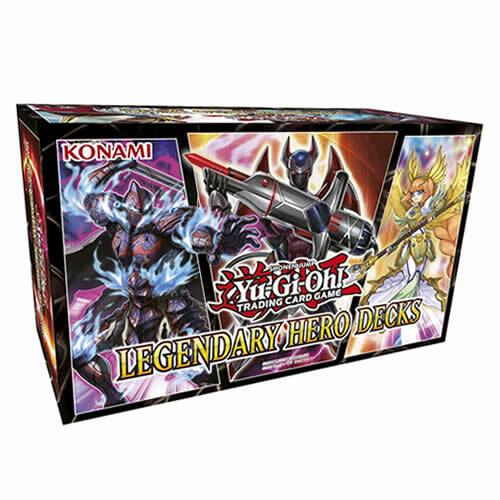 TRADING CARD GAME presents Legendary Hero Decks! This box set comes with 3 unique Decks featuring the kind of monsters you’d want on your side if the fate of the world depended on the outcome of a Duel! Aster Phoenix’s Destiny HERO Deck excels at driving opponents into a corner with effects that inflict damage or pierce through defending monsters. Like Jaden’s Elemental HERO Deck, the Destiny HERO Deck also Summons powerful monsters through Fusion! This Deck also includes 2 new “HERO” Link Monsters you can use in any HERO Deck: A Link-2 monster that retrieves your Fusion Summoning Spell Cards from the Graveyard and a high-ATK Link-3 monster with Link Arrows that all point towards your field, giving you space to summon 3 Fusion Monsters at once! Thor, Loki, and Odin once again descend upon the Dueling world! Boasting some of the highest ATK values among all Synchro Monsters, Team Ragnarok’s ace monsters from Yu-Gi-Oh! 5D’s hold a special place in the hearts of Duelists. Now, a new Link Monster makes it easier to assemble the Synchro Materials needed to Summon an “Aesir” monster, and this Deck’s Extra Deck also comes with more high-powered Level 10 Synchro Monsters, including the legendary Ascension Sky Dragon! The Phantom Knights Strike Back! 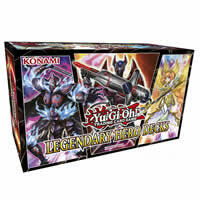 Phantom Knight Decks focus on Xyz Summoning and using Trap Cards to turn the tides of battle. Almost all of their monsters, Spells, and Traps have additional abilities you can use once they’re in the Graveyard, creating opportunities for huge comebacks! This Deck includes a new Trap Card and a brand new “Phantom Knight” Link Monster that Sets Trap Cards directly from your Deck and can destroy any card on the field when a DARK Xyz Monster is Special Summoned to a zone it points to! • Includes 3 x 40 card decks, with 10 card extra decks. • Each deck includes 5 Ultra Rares and 45 Commons. • Includes Hero, Nordic & Phantom Knight themes.